Who has got the best super car, the most expensive super bike, the automobile with the loudest exhaust, the sleekest paint job and so on. It is all about bragging rights; coupled with awards and an exclusive after party for every winner. This is a festival of Motorsports featuring automobiles with the likes of Ferrari, Ducati, Brabus, Lamborghini, Harley Davison, Porsche and more. 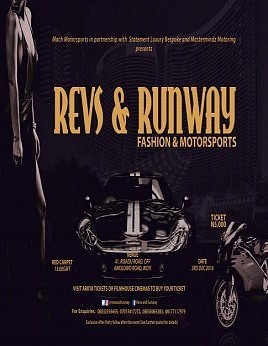 Also see the best and fast rising Nigerian fashion brands on the runway with a touch of luxury. An exclusive after party follows after the event with special guest celebrities and performances. Need not say more, this is an event you would not want to miss.